I take great delight in watching the joyful abandon of children. Last week, St. Paul’s Church, Nobleton held its annual Bible Fun Camp – five mornings of fun and Bible learning offered to the children of our community. When I volunteered to be “of any help I could,” little did I know that I would be depriving someone else of the privilege of teaching children for the week! While it made for a very busy week (with all the usual responsibilities), it was a week of blessing. Watching children concentrate on a craft helps me see their creativity. Watching them listen carefully to a biblical concept as it’s taught, and watching them learn a Scripture verse by memory, is heart-warming. Watching them go on a scavenger hunt for various things in God’s creation gives me hope. Watching them prepare with absolute glee to throw cream pies at me, however, simply struck fear in my heart! Why would I submit to all this? As a pastor, don’t I have the right to say, “I’m too busy”? Probably, but here’s why I gave up five mornings and let children play target practice with my head: memories, and relationships. My earliest memories of church life are of Vacation Bible Schools of my childhood. I didn’t go to church as a youngster, so VBS was pretty much my only exposure to church as a kid. But those concentrated weeks of learning and fun were part of the foundation for what became my profession of faith in Jesus Christ. I thank God still today for the people who gave of their time and themselves to help me know Jesus through VBS. And relationships are key to growing faith in young people (and their families). Many people still have a view of clergy as ‘untouchable’, as aloof, as different. I have worked hard to be as accessible and as ‘normal’ as possible in my ministry, because it helps to tear down barriers that otherwise keep people at a distance from me – and thereby from the church, and even from the Lord. The Apostle Paul was all for breaking down these barriers, too: “When I am with those who are weak, I share their weakness, for I want to bring the weak to Christ. Yes, I try to find common ground with everyone, doing everything I can to save some” (1 Corinthians 9.22, NLT). This is why engagement with the culture is so important. It’s not the church’s role to assimilate itself into the culture, becoming indistinguishable, but to use the culture’s means to communicate the timeless truth of God’s love for us in Jesus Christ. 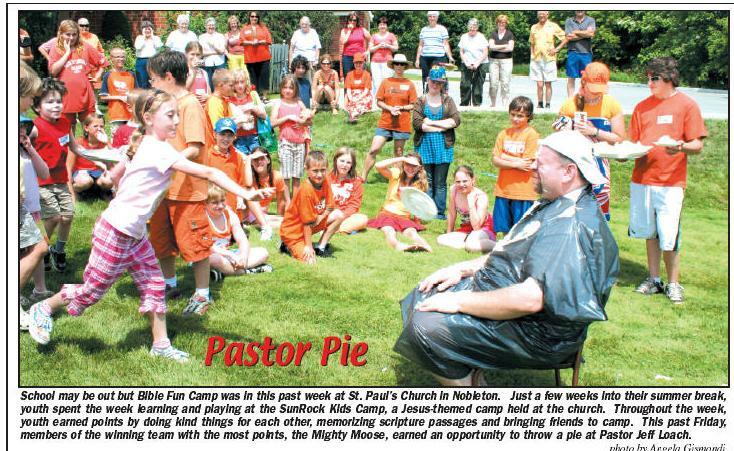 If doing things like taking pies in the face will help bring people to Jesus, all I can say is, “Bring on the NutriWhip!” How about you?